How often do you think about your refrigerator? For many people, their refrigerator is a silent, magical appliance in the kitchen that keeps their food and beverages chilled to perfection. The only time anyone worries about it is when they think it may not be working the way it was designed. If you recently purchased a Haier Top Mounted Refrigerator, a recent recall might be giving you some cause for concern. Read on for important information on why this recall was issued, which models it involved, and how to determine whether or not your refrigerator is one of the units affected. Haier America announced the recall of some models of its Top Mounted Refrigerators on October 25, 2018, in cooperation with the U.S. Consumer Product Safety Commission (CPSC). They did so because of a potential hazard caused a short circuit in one of the refrigerator’s electrical components that could catch fire. Haier America manufactured these models in China. They were sold at Lowe’s Home Improvement and other independent appliance retailers across the country between September 2014 and October of 2018. Individual units would have sold for somewhere between $400 and $500 at the time of purchase. The total number of refrigerators affected by the recall is around 137,000. At the time of the recall, only three incidents had been reported to the U.S. CPSC and Haier America. Owners reported smoke, fire, and property damages associated with the fire having occurred. No one has reported injuries stemming from the incidents. Haier America has previously recalled both the Haier and Black & Decker Brand Chest Freezers because of a capacitor in the freezer’s circuitry overheating and creating a fire hazard. The original recall notice went out in 2010, and was expanded in 2013. In the original recall, around 68,000 units were involved. The expansion added around 41,000 units to the recall. While no injuries were reported, at least one fire incident related to this recall has caused extensive property damage. In the fall of 2013, Viking recalled its Built-In Side By Side Freezer with In-door Dispensers because of a potential fire hazard caused by overheating electrical connectors in the refrigerator wiring harness. No injuries were noted in incidents reported to the U.S. CPSC or the manufacturer, same as with the current Haier America recall. Free in-home repair. The manufacturer will make arrangements for a qualified service technician to come to your house and repair your refrigerator at no cost to you. Refund. Haier America is also providing refunds in the form of a $150 rebate if you purchase a new Haier refrigerator that is on the list of qualifying models. To take advantage of either option, you will need to contact Haier America through their recall hotline, and verify with them that your current refrigerator is on the list of recalled models. At this time, you can ask which refrigerator models qualify for the rebate and decide which option to pursue. Haier America’s recall hotline number is 1-888-364-2989. This hotline is open on Monday through Friday between 8 AM and 5 PM Eastern. You can call this number with any questions you may have related to the recall, including ones related to the remedies listed above. Before you try to contact Haier America about this recall, you will need to know your refrigerator’s model number and its serial number. They are listed on a label that is located near the upper left hand corner of the upper rear panel in the back of the refrigerator. This label will list a series of numbers. The model number is at the top of the list while the serial number is at the bottom. There are two ways consumers can check on the status of their Haier Top Mounted Refrigerator. The first option is to visit the manufacturer’s recall website listed above. 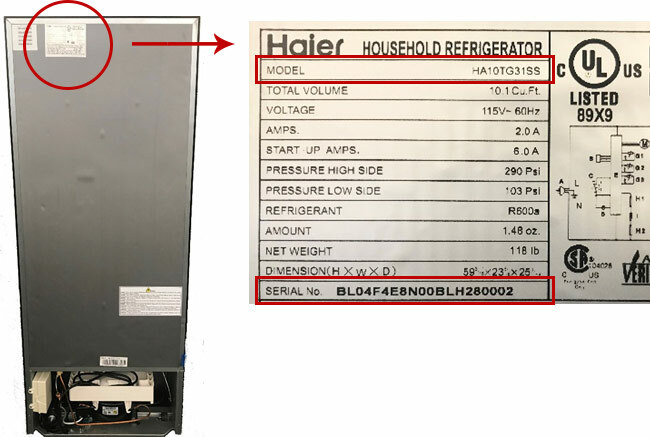 Haier America has added a simple tool to the page which allows you to enter the model and serial number and search their list of affected refrigerator units. If your model and serial number come up in the list, you will need to call the recall hotline and discuss the above-stated remedy options available to you. Your other option is to check the recall notice on the U.S. CPSC website. They list all of the model and serial numbers affected there. After checking the list, call the recall hotline to verify your refrigerator’s status and learn more about what your options are. You need to reach out to Haier America if you have any concerns about your refrigerator being one of the units involved in this recent recall. They will be able to answer your questions, verify the status of your refrigerator, and help you choose the best remedy option for you and your situation. If you have any other appliance repair needs, though, please do not hesitate to reach out to us.